Yelp challenged the order, asserting that Hassell failed to prove that the post at issue was actually defamatory, that Yelp could not be held liable for the speech pursuant to the Communication Decency Act, 47 U.S.C. § 230 (“Section 230”), and that Yelp could not be compelled to take down the post as a non-party to the suit. The trial court rejected Yelp’s arguments and refused to recognize Yelp’s free speech rights as a content provider. The California Court of Appeal affirmed the trial court’s decision, holding that Yelp could be forced to remove the supposedly defamatory speech from its website without any opportunity to argue that the reviews were accurate or otherwise constitutionally protected. This decision is frankly just wrong—and for multiple reasons. Neither court seemed to understand that the First Amendment protects not only authors and speakers, but also those who publish or distribute their words. Both courts completely precluded Yelp, a publisher of online content, from challenging whether the speech it was being ordered to take down was defamatory—i.e., whether the injunction to take down the speech could be justified. And the court of appeals ignored its special obligation, pursuant to California law, to conduct an “independent examination of the record” in First Amendment cases. Both courts also seemed to completely ignore the U.S. Supreme Court’s clear holding that issuing an injunction against a non-party is a constitutionally-prohibited violation of due process. EFF—along with the ACLU of Northern California and the Public Participation Project—urged the California Supreme Court to accept the case for review back in August 2016. The court agreed to review the case in September, and we just joined an amicus brief urging the court to overrule the problematic holding below. Our brief—drafted by Jeremy Rosen of Horvitz & Levy and joined by a host of other organizations dedicated to free speech—explains to the California Supreme Court that the First Amendment places a very high bar on speech-restricting injunctions. A default judgment simply cannot provide a sufficient factual basis for meeting that bar, and the injunction issued against Yelp in this case was improper. 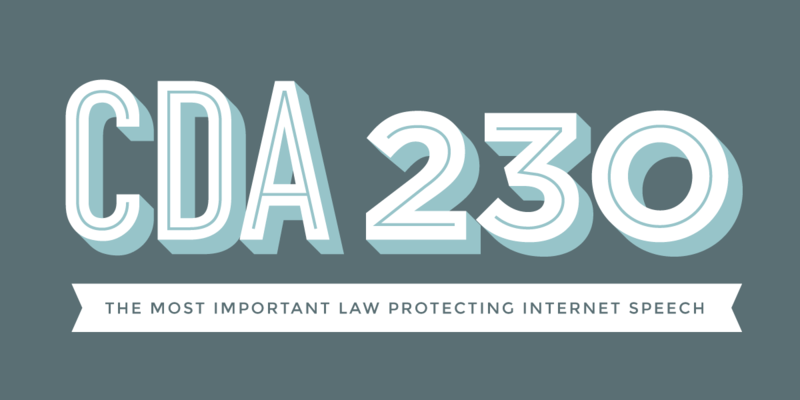 We also explained that the injunction violated clear Supreme Court case law and Yelp’s due process rights, and that the injunction violates Section 230, which prohibits courts from holding websites liable for the speech of third parties. As Santa Clara University law school professor Eric Goldman noted in a blog post about the case, the appeals court’s decision opens up a host of opportunities for misuse and threatens to rip a “hole” in Section 230’s protections for online speech—protections that already seem to be weakening. If not overturned, as the already pervasive misuse of default judgments teaches, this case will surely lead to similar injunctions that infringe on publishers’ free speech rights without giving them any notice or opportunity to be heard. The California Supreme Court cannot allow this.